Today marks a major milestone in the life of SwiftyBeaver as product and company: the public release of the SwiftyBeaver Logging Platform. Continue reading about some key takeaways of the beta period, important changes for beta users, the new plans and and how the release is celebrated. 3 months ago, my team and I were excited and frightened at the same time. It was the private beta release of our new logging platform for Swift. The huge success of the open-source SwiftyBeaver Logging Framework, now with nearly 1,500 Github Stars made me wonder if we can really port that enthusiasm of the userbase into a full-fledged platform for logging during development and also release which consisted of the framework, an encrypted cloud service and a Mac App to consume the logs. Especially I was full of fear because I did not know how Swift developers would like the unheard idea of using a Mac App for log browsing instead of a website and if the problem of frictionless logging during development and release was really the large problem that I experienced by myself. Today, after 3 months and after having more than 1,100 Swift developers test and use the platform in private beta, I am confident to say that the problem of Swift logging is shared by most other Swift developers and is at least as big as I thought it would be. The decision to use a Mac App instead of a website to consume logs was also praised by all beta testers and seen as major innovation and advantage in the developer’s workflow. Using a native app for logging 8 hours a day lead to a much better experience due to zero-latency searches and the physical ownership of all logging data and the end-to-end encryption were important bonuses on top. Slack has been the most important tool during private beta. Especially helpful and valuable for all of us during private beta was the SwiftyBeaver Slack Channel, another experiment that I wanted to do. I expected that just a handful of beta testers would join, since public Slack channels for companies and beta products are still something relatively new. Fortunately, I was wrong in my assumption. More than 33% of all private beta users joined the SwiftyBeaver Slack Channel and lead to some great, very valuable, often funny discussions about ideas, features and issues. The discussions were far deeper than any email conversation, Github issue or survey could have ever been. Until the introduction of the Slack channel I was using Github issues to discuss with users. Slack made that obsolete. Another important learning was that the SwiftyBeaver Logging Platform is used by teams of all sizes. At first I thought that large tech companies would have their own in-house logging solution and SwiftyBeaver would just be something for smaller dev teams. But I was proven wrong again. Agile mobile development teams at large companies introduced the SwiftyBeaver Logging Platform, many already in production. They especially like the end-to-end encryption from a user’s device to the developer’s Mac App and the possibility to use their own servers to not share their valuable app & user data with external logging services. End-to-end encryption fits to their high compliance regulations and their strict need for privacy and the protection of business secrets and business value (= collected user data). Even medical institutions and health sector companies introduced SwiftyBeaver for their health tracking, diagnosis & patient management apps due to the unmatched encryption & compliance. An enterprise plan, where larger companies can use their in-house servers instead of the SwiftyBeaver platform’s cloud service, and the permission concept of organizations, where multiple developers can access the same log data, were the two most frequently requested features by companies during private beta. 🌄 💯 🙌 — It is here! From today on,the SwiftyBeaver Logging Platform is publically available to everyone, including a new website and the possibility to directly download the release version of the SwiftyBeaver Mac App. Together with the release the commercialization of SwiftyBeaver has started. 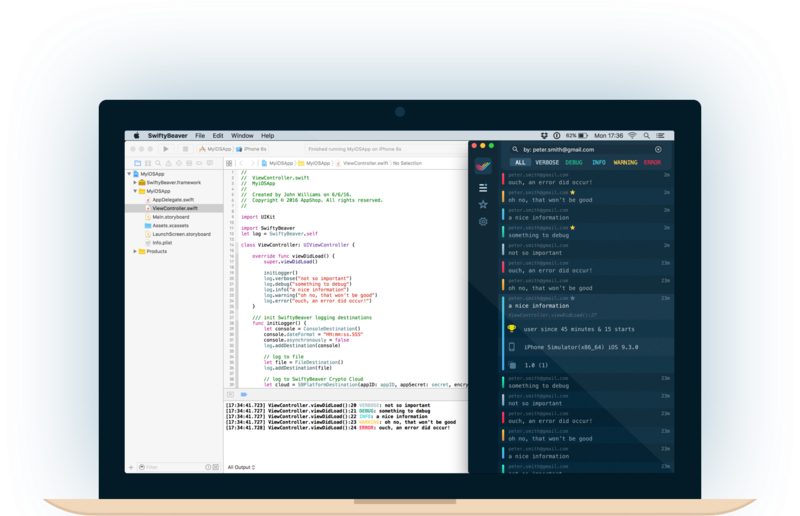 SwiftyBeaver is a bootstrapped company and the revenue will allow the continuous development of the platform, consisting of frameworks for multiple programming languages, native apps for Mac and iOS and the encrypted in-house / hosted cloud service. Besides the need to earn money to finance the company, I also wanted the SwiftyBeaver Logging Platform to stay free for developers who just need logging during development or who want to quickly try it out. I am happy that the 3 new plans Free, Personal and Organization do reflect that. That is the default plan when you download the Mac App and it comes fully featured. The only limitation is the amount of time your logs are stored in the cloud and are accessible inside the app. The free plan is meant for developers who are using SwiftyBeaver for development logging and who need real-time visibility of their logs on their test devices and the simulator but do not need older logs. In the free plan, all logs that are older than 1 hour are not displayed and / or deleted. For a longer log history or logging during release please choose the personal or organization plan. That plan is meant for single developers who want to see what is going on in their app during release or extended development and who do not want to lose logs which were automatically downloaded by the SwiftyBeaver Mac App. Since app credentials are bound to a developer account, all logs of the developer can just be downloaded and opened by that account and can not be shared with other SwiftyBeaver users. The personal plan includes 7 days of cloud history, which means that you just need to download your log entries by opening the Mac App every 6 days, and unlimited local history. Very often more than one developer is developing an app and is responsible for monitoring and analyzing the incoming logs from user devices. For this kind of scenario we made the organization plan where you can share your app credentials securely with your team. The organization plan includes 3 developer accounts where one is the organization owner and 2 accounts are the organization members. All 3 accounts have 14 days of cloud history. You can order more users at any time for an additional charge. All paid plans are on a monthly recurring subscription, annual plans are coming soon. Additionally, all paid plans offer an unlimited amount of apps and traffic so that you never have to fear any unexpected limitation when your app is ranking high in the App Store. I wanted to have a smooth transition from private beta to release but still present a clear path towards the decision to either stay in the limited free plan or to move into a paid plan. During private beta, you could access your logs in the cloud and in the Mac App without any time limit. From today on, that is not possible anymore and all private beta users are automatically moved into the free plan. In the free plan you will just see the logs of the last hour in your Mac App. All already downloaded logs stay in your .beaver file are not deleted from your computer but they are not displayed anymore in your Mac App (if older than 1 hour). Within the next days, all logs that are older than 1 hour are also periodically deleted from Crypto Cloud for all users who remain in the free plan. Upgrade immediately, no local data is lost. Therefore I recommend an immediate upgrade into one of the paid plans if you want to access logs that are older than 1 hour. After downloading the new Mac App version you may also be asked to log-in again. That is caused by a changed authentication mechanism which forbids a server connnection of all private beta versions of the Mac App. Please just log in again and all is fine, no local data is lost. The Slack channel will stay open and will from now on be accessible to all users. Please continue to provide feedback and report any issues there. And let’s have some virtual beers or two 🍻. Today’s release is also a great opportunity to spread the word about SwiftyBeaver and to let other developers know why you think it matters. Product Hunt is a great place to announce and discuss new products and I picked it as our sole release announcement site. It would be fantastic if all private beta users could go to our product page on Product Hunt to leave a comment and a vote. Thank you! just on July 19, 2016 you can save 25% on each paid plan with the discount code “PH25”. Thank you and see you all on Slack and Product Hunt! Founder & CEO at SwiftyBeaver. Prior CTO / CEO / founder of several VC-backed companies, including Wunderlist & RhodeCode.